Mohave County E.R.A.C.E. 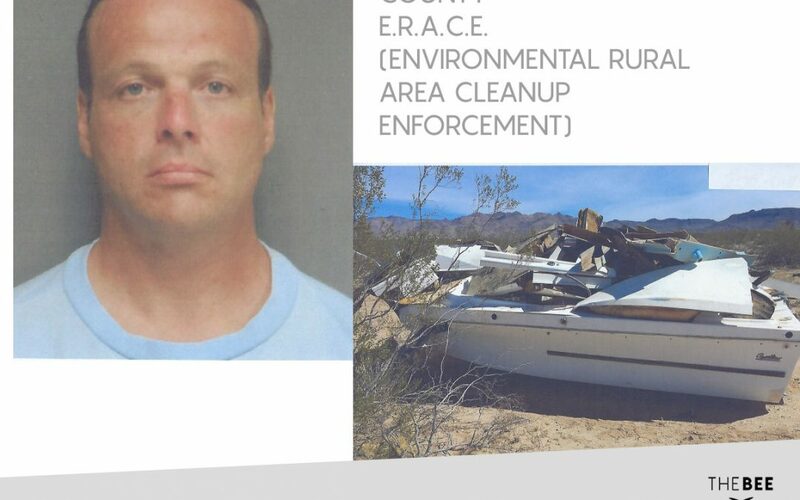 (Environmental Rural Area Cleanup Enforcement) – A Golden Valley man admitted to illegally dumping a boat near Alamo Road and Shipp Drive in Golden Valley. Walter Platt, 51, was charged with criminal littering exceeding 300 pounds, a class 6 felony. On March 6th, 2018, a witness provided ERACE detectives with information leading to the originating property. During the course of the detectives’ investigation, an empty boat trailer was determined to have been used by Platt to remove the boat. Detectives also reported that Platt provided a written statement advising that he did in fact dump the boat. Note: In addition to working police investigations and presenting prevention programs, Mohave County E.R.A.C.E. sponsors free community cleanup trash collection events in several locations around the county to help reduce illegal dumping. You are asked to please call E.R.A.C.E. directly at (928)715-0480 if you have information on an illegal dumpsite or call Mohave Silent Witness at 1-888-227-8780 if you observe an illegal dumping in progress.